It’s only been half a year on Kwekerijweg 2C, and we’ve had another Moving Day, again already now. Still, there was some heavy stuff we had to bring, including a desk we swear weights more then 300 kilo’s. So we ordered pizza for everybody and had a sit in. We needed to get the new office space up and running quickly, so we (Vincent, Dominic, Matthijs) where there all night cleaning and setting up the place, and today we’ve bought more plants, to green up the place. 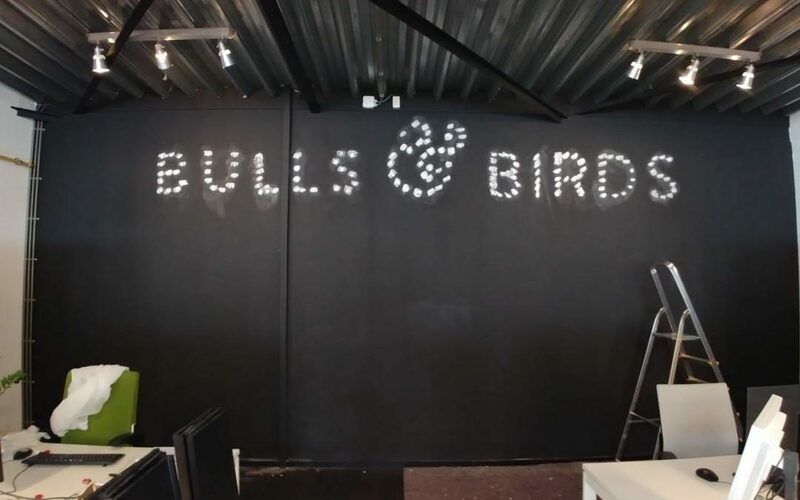 We’ve also begun pimping the room with wallpaper, and we’ve got to paint over the last owners sign; Bulls and Birds. The new office is at least three times as big as our last one, and we really like the industrial look of it. We’ll probably be here for years, so we’ll be spending our weekends on really prettying the place up. We’ll post up a virtual tour of the place on our Applied Games section.